I'm really into my skincare at the moment and I'm really enjoying trying new products that will help improve the condition and appearance of my skin. But it got me thinking more about my skin type and what products are actually aimed at me. We all have different skin types and everyone's skin has different needs. But do you know which cleanser is right for your skin? If you have dry skin, you will be used to sore, dry and flaking skin. Your pores will be small and you'll be more prone to dullness. When it comes to picking the perfect cleanser for dry skin, it is essential that you find one that is going to be soothing and moisturising. The best type of cleansers for dry skin include cream based cleansers which work amazingly well for those with very dry skin. Some of my favourite cream based cleansers are the Liz Earle Hot Cloth cleanser and the No7 Soothed and Gentle cleanser. If you wear a lot of makeup on a daily basis, then an oil based cleanser can be a great option for you. Balms are also great for those with dry skin as they're so soothing and gentle. It is best to avoid foam cleansers if you have dry skin because they can be too harsh and strip the skin of all it's natural goodness, which can end up leaving your skin feeling and looking more dry than before. 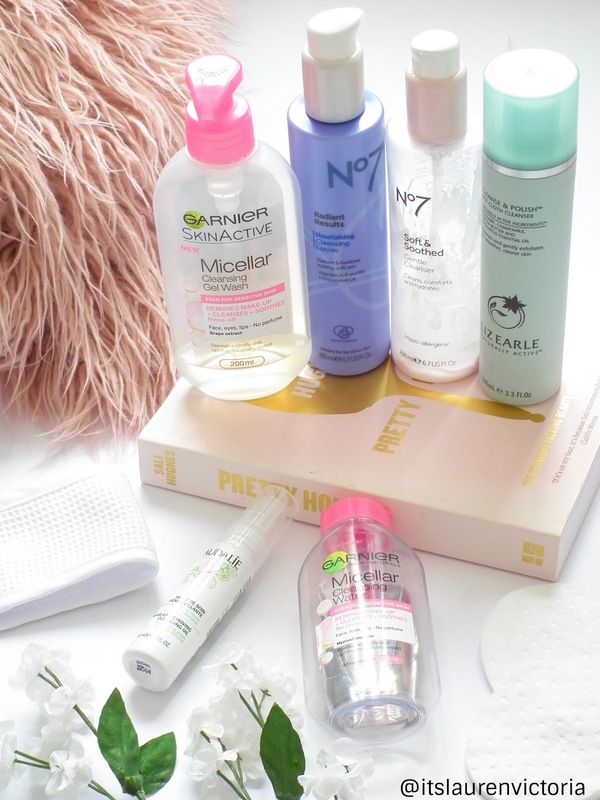 When you have sensitive skin, it's always good to do a trial and find out what ingredient in the products you already use flares up your skin. Then you can eliminate this trigger ingredient from your future skincare purchases. It is a good idea for people with oily skin types to use a gentle cleanser that will help to calm any acne that you may be more prone to. Milk or balm cleansers can be amazing for those with oily skin. It is important to find a balm that doesn't leave you with a greasy oily residue and instead you should find one that rinses cleanly. When we're dehydrated, we know that the best thing to do is to drink more water. And water is exactly what dehydrated skin is lacking. You can have dehydrated skin and still have oily skin. It is very easy to get dehydrated skin and dry skin mixed up, but dry skin is more the lack of oil than water. Again foaming cleansers need to be avoided when it comes to dehydrated skin. You need to opt for a gentle yet effective cleanser that won't leave the skin feeling tight, dry or greasy. Balms and oils will be a dehydrated skins best friend. I'm loving the Caudalie make-up removing cleansing oil. They will help to bring a healthy and glowy look back to the skin. If you're more like me and have just normal skin, then is well balanced meaning it is not too oily, but it's not too dry either, then you will find your skin can be very well easily managed. The only thing you have to really consider with normal skin is that you adjust to fit according to how your skin is at a particular time. But this also means that is essential you still continue to take care of your skin well even when you don't have any major problems like dryness or excess oil. You still need to continue with keeping your skin well moisturised to avoid dryness and to protect it from any damage from harsh chemicals, UV light or possible reactions.